There was a lot of curiosity at the talkback with playwright, Brenda Withers on Saturday, April 6. Since curiosity is Kickshaw's organizing value, it made for a great conversation! 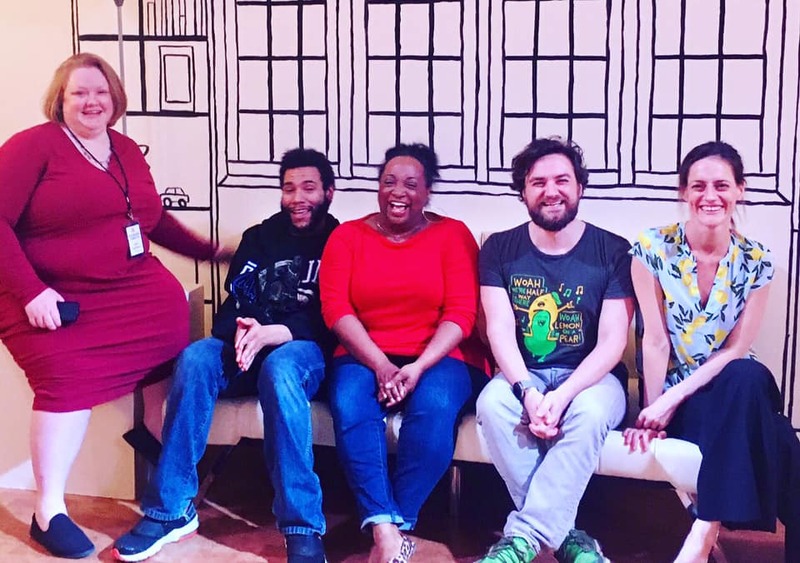 Lynn Lammers, Dan Johnson, Casaundra Freeman, Daniel Helmer, and Brenda Withers (playwright) after the April 6th performance. As other questions were posed, Ms. Withers would often throw them back to the audience: "I'm curious about what you think..." she would say. While happy to fill in some of the back story of the how and why of writing The Ding Dongs, it became clear that Ms. Withers' own curiosity drives her and that her goal is to stimulate the audience's thoughts, guesses, and interpretations...allowing each of us to process the play within our own framework of experiences. "One of the things I love about The Ding Dongs is that it invites many interpretations. When I first read the script, the migrant caravan immediately came to mind. I thought that surely Brenda Withers was writing to illuminate that situation. It turns out, no, she wrote this play years ago, long before parents and children from Central America embarked on their journey toward the United States. The thing is, the play is written abstractly. It doesn’t name the traumatic turn of events that Joe and Natalie have experienced. Because it doesn’t have to be about one particular refugee crisis, I decided it can really ask bigger questions about how populations have migrated throughout history. Those shifting populations are often catalyzed by a need to escape violence and persecution. When and where have these migrations caused death and destruction versus acceptance and opportunity? Here’s the great thing about this play, though: you don’t need to see all of those layers to enjoy the show. On its face, it is a funny, suspenseful thriller that will keep you guessing. And I’ve found, over the last two weeks, that many of our patrons have had wildly different interpretations. That’s fascinating to me, and satisfying. It’s never my intention to dictate what meaning my work has to each individual patron. You bring your own worldview and life experiences to the play. Each patron is having an individual experience and a communal experience at the same time. And I’m so glad to be a part of it." 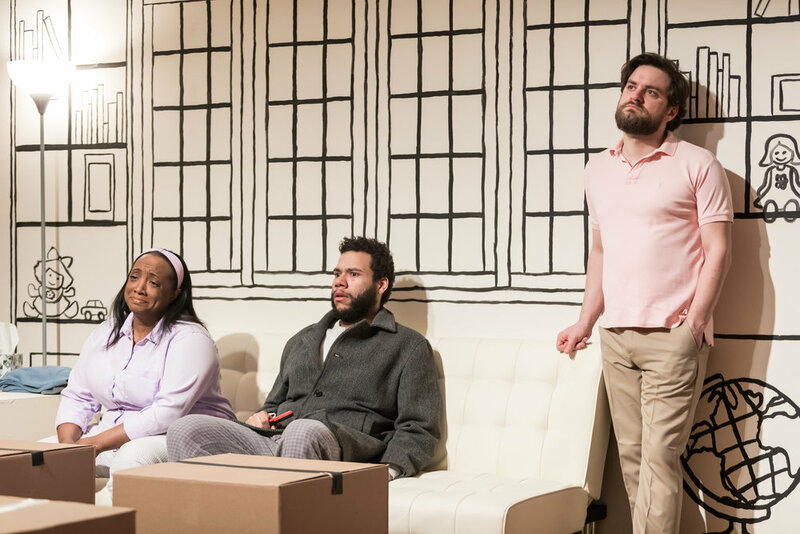 "Drawing inspiration from Edward Albee, Eugene Ionesco and other absurdists, Withers explores themes of private property, colonialism, migration, and violence through the seemingly innocuous—and often hilarious—story of Natalie (Casaundra Freeman) and Joe (Daniel Helmer), a couple stopping by for a visit to their childhood home. 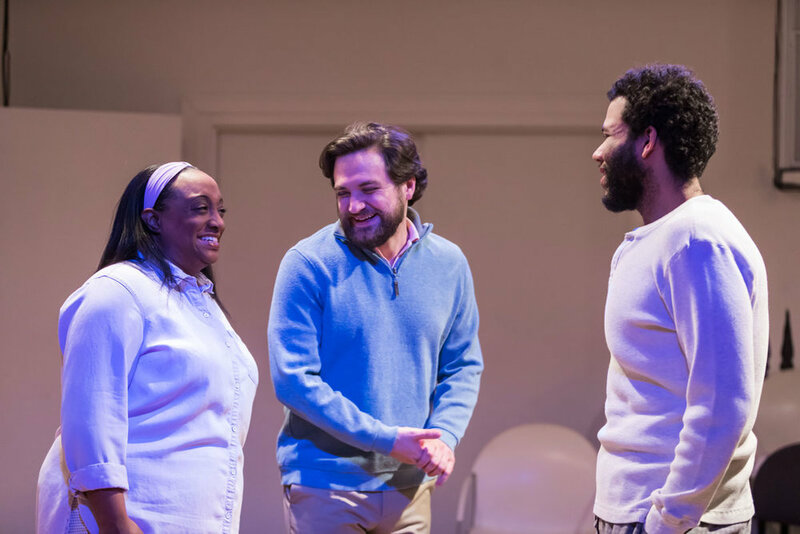 With semantic games, humor, and distraction, the couple manipulates their way into the home, currently occupied by Redelmo Smith (Dan Johnson). Lynn stages the play so that the audience is complicit in the subterfuge. Seated along two sides of the stage, as audience members we are physically placed so that our perspective changes as the actors move through the space. We are sometimes physically and figuratively behind Redelmo, the confused homeowner who may or may not be losing his place in the world. Other times we are on the side of Natalie and Joe, whose recent displacement has led them to fight for the survival of their family. We witness the high-stakes negotiation between the characters, and are also complicit as we choose sides or choose to disengage. “Doing nothing is a choice,” Withers asserted during the talkback. In times of political turmoil, choosing to do nothing can be as powerful as a making a choice to get involved. What are the consequences to the people directly affected, to others and even ourselves? While the play doesn’t provide answers, it provokes questions and critiques about the perpetuation of violence, the construct of land ownership, private property, contracts, borders, and how we decide who “belongs.” By putting the audience in the shoes of Natalie, Joe, and Redelmo, the play invites us to see the world from their perspectives, rather than placing blame on one party. We have the opportunity to zoom out and examine the systems and structures that enable cycles of violence and displacement throughout history and geography, and ask ourselves if this is the only way." "When Redelmo (Dan Johnson) entered and sluggishly fell upon the couch, I was immediately wondering why. It was the middle of the day and he looked tired. As Redelmo pulled himself from the couch and confronted the two aggressive strangers on his porch my imagination began to churn. Could this really happen? Driving by old residences, day dreaming of days gone by and even taking the step to approach the home, it could happen. But as the play progressed and Natalie (Cassandra Freeman) and Joe (Daniel Helmer), began to evolve in front of me. I sat mesmerized. With mental health awareness finally gaining national attention, I wondered if there was a tie-in. As the action continued there were many tell tale signs this all may be happening in an overwhelmed mind. How traumatic was the loss of Redelmo’s brother? How were he and the children coping? Were these two people really so desperate to squat in Redelmo’s house or were they squatting in the deep dark depths of his unconscious? And as the exchanges intensified and sent chills running through me, I envisioned the struggle within Redelmo. Brenda (the playwright) was truly mysterious in our back and forth discussion of the play. She did not lead me or tell me what was in the back room, or what was her intended meaning of the boxes, or how many house’s Natalie and Joe may have approached before they came to Redelmo. With a whimsical smile and curiosity of a true artist, she allowed my imagination to take me where it will. This is the beauty of Kickshaw Theater: unleash the curiosity and the journey of imagination." Want to share your interpretation of The Ding Dongs with us? Tell us your thoughts in this short this form.